Spotted twill silk, embroidered with silk thread, lined and backed with silk and cotton, hand-sewn. Given by R. Brooman White, Esq. Male visitors to occasions at European royal courts, such as royal birthday balls, were required to wear spectacular, ornately decorated court suits. The style of these continued a long-established tradition and were conservative in cut, as this example shows, retaining curved fronts and deeply pleated back-skirts of suits from previous decades. 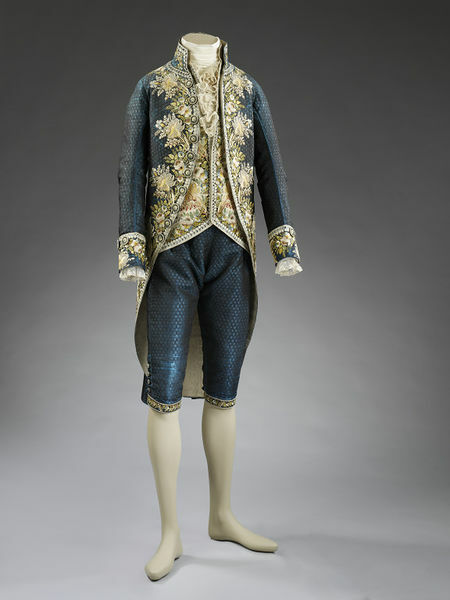 The high collar of the coat and waistcoat however reflects the changes in fashionable dress of the 1780s and 90s. The suit needed to be worn with a shirt with lace ruffles at the neck and sleeves. Meanwhile, everyday dress for men was much more practical, and consisted of plain wool frock coats, breeches and boots, rather than shoes with silver or jewelled buckles. Many court suits were embroidered with coloured silk thread in floral patterns. The best embroidery was carried out in professional workshops in Lyon, the centre of the French luxury textile industry. The embroidery on the coat of this court suit is extensive, even edging some of the back pleats, where it would barely be visible. The technical quality of the work is exquisite and is particularly seen in the shading of the flower petals and leaves. The larger flower heads are filled with stitches creating a square mesh imitating the delicate laces and nets used to trim fashionable women's dress. 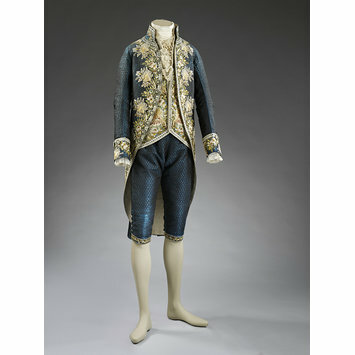 Man's coat, dark blue figured silk, embroidered mainly in satin stitch with coloured silk thread, cut with a high stand collar, long curved fronts, tight sleeves with cuffs, back skirts with deep pleats either side of centre back, with two large shaped pocket flaps either side. The embroidery extends down the coat fronts and tails, on collar, cuffs, and around the pockets. The design consists of repeating branches of stylised flowers and slender leafy stems in shades of blue, white, green, yellow and pink, with a border of small blue and white daisies. The ground is woven with small discs. The coat has 10 buttons on the left hand front edge, 3 on each cuff, 3 under each pocket flap, and, all embroidered with a single blue and white flower head within a border. The coat is lined with pale blue silk. Hand stitched. The royal courts of Europe dictated a dress code of formal silk suits for men, worn with lace accessories and jewelled swords. French court suits were most desirable. They were made for export to countries including Russia and Spain, even during the French Revolution. The cut of the suit, with tight sleeves and a narrow back, dictated the wearer’s posture and movements. Details such as collar height and size of buttons reflected fashions in everyday dress.